This product is not available in your country. Listing the products available in other countries across the globe. ARIETTA Prologue is a compact and portable diagnostic ultrasound system with functions that can improve efficiency and support rapid, accurate diagnosis for point-of-care applications. ARIETTA Prologue has been designed especially for the point-of-care (POC) ultrasound market. Thanks to its intuitive and simple operation, it fulfils the fundamental role of a portable ultrasound system and extends the clinical benefits of diagnostic ultrasound into new areas of healthcare. The design and usability of the ARIETTA Prologue has been comprehensively evaluated to deliver high performance fitting a wide array of user and clinical requirements. ARIETTA Prologue supports a broad range of examinations and, with its compact hand-carry design, can be used in a various types of Clinical settings. ARIETTA Prologue offers superior imaging quality and is equipped with functions that improve efficiency and supports rapid, accurate diagnosis. Silky Image Processing (SIP) is an adaptive tissue filter that boosts edge enhancement and contrast resolution providing clean tissue borders and detailed parenchyma. Spatial Compounding is achieved by transmission of beams in multiple directions to reduce artefacts. Tissue boundaries can be visualized clearly. Trapezoid mode can be used with the linear transducer extending the width of the field of view. Needle Emphasis technology enhances the visualization of the needle, offering increased safety and accuracy for biopsy and other interventional procedures. 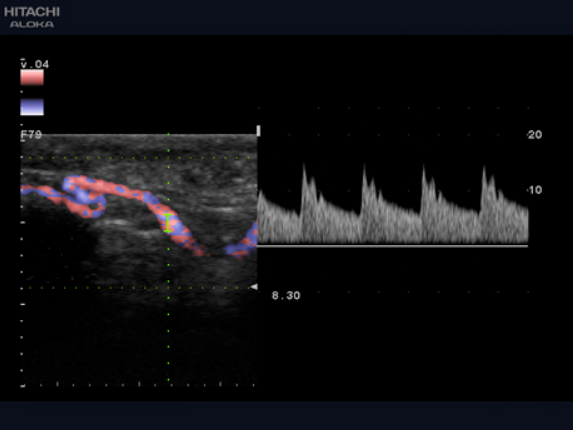 Dynamic ultrasound is the ideal imaging method for non-invasive assessment of the kinetic function of ligaments, muscles, tendons, etc. 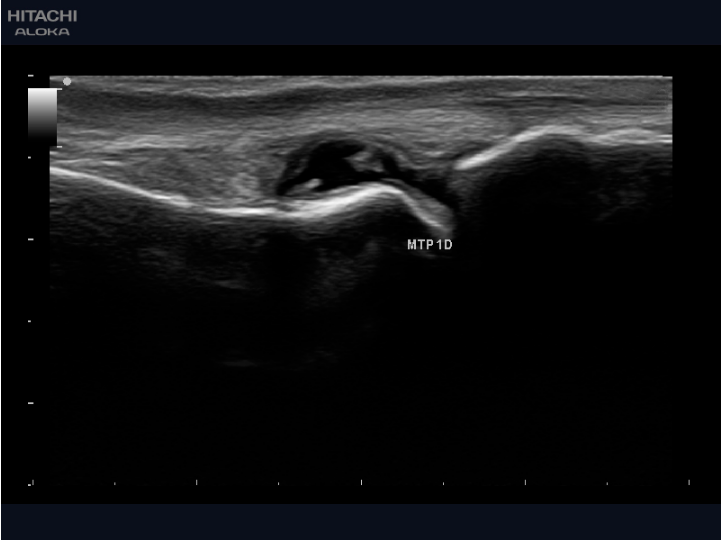 Additionally, ultrasound examination of joints can play an important role in the diagnosis of rheumatoid arthritis and monitoring of the patient’s response to therapy. With the excellent superficial imaging performance of the 18MHz high frequency transducer compatible with the ARIETTA Prologue, you can visualize details such as avulsion fracture of the bone surface, or ligament/tendon fracture, diagnoses which are often missed by X-ray examinations. Observation of synovial proliferation of the digital joints in the early stage of rheumatism is also possible. Basic operations such as image size or gain adjustment can be made intuitively with one hand using touch screen gestures. Optimized settings for examination of any body part can be selected. 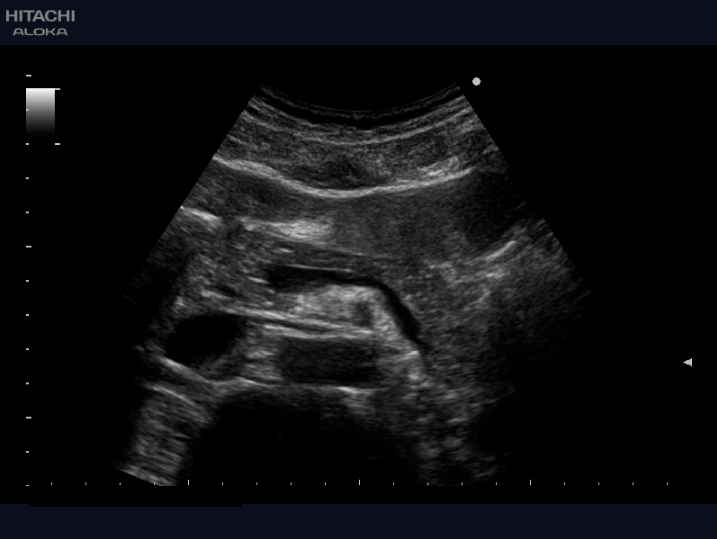 Indications for abdominal ultrasound examinations can cover many different organs such as the liver, gallbladder, pancreas, kidney, spleen, gastrointestinal canal, etc. Strong performance for detailed visualization from superficial to deep with a wide field of view is required. ARIETTA Prologue uses the same advanced image processing technologies normally reserved for high-end systems. 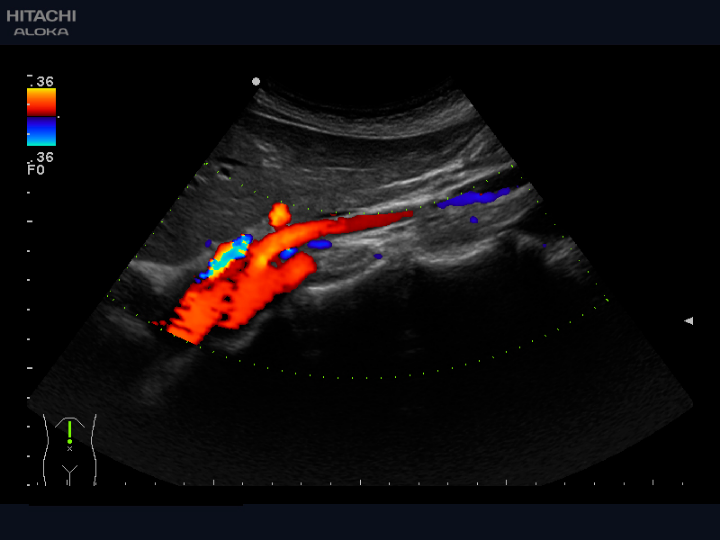 You can observe parenchymal organs such as the liver and pancreas with superior clarity; eFLOW, a high resolution colour mode, can be used for delineation of small renal vessels. Further, Hitachi’s 1-5 Mhz Multi Layered Convex Transducer ensures deeper penetration and superb resolution irrespective of obesity of the patient. Intuitive, one-handed adjustment of basic parameters such as image size can be made using touch screen gestures, when observing organs of different sizes such as the liver, pancreas, etc. Optimized settings for examination of any body part can be selected. 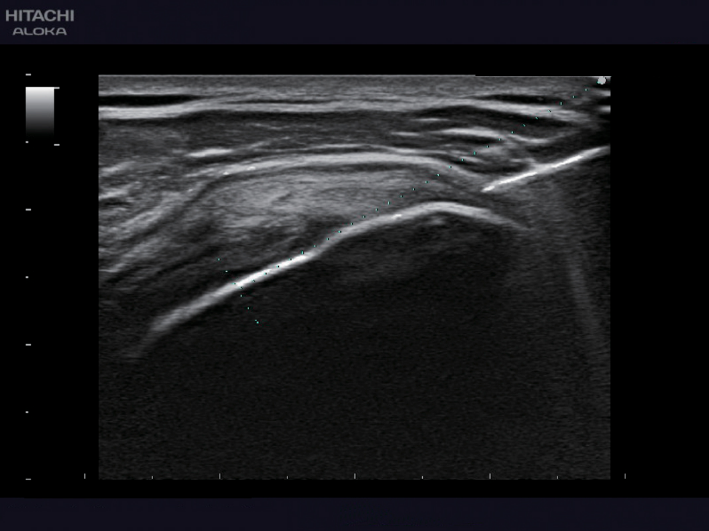 Ultrasound guidance is commonly used for the delivery of nerve blocks, providing visualization in real-time of the nerve or group of nerves, the correct needle placement, the surrounding tissues, and the spread of the local anaesthesia to the right location, offering potential maximum patient benefit. ARIETTA Prologue uses the same advanced image processing technologies normally reserved for high-end systems and together with the excellent superficial imaging performance of the 18MHz high-frequency transducer, enables observation of nerves, vessels, and muscle tissues with clarity. Additionally, Needle Emphasis, a technology to enhance the visualization of the needle, can increase the safety and accuracy of its placement. Basic operations such as image size and gain adjustment can be made intuitively with one-handed touchscreen gestures. An accurate and safe clinical assessment of the gravid uterus throughout a woman’s pregnancy including characterizing pregnancy location, identifying the number of embryos present and aiding in the prenatal diagnosis of fetal anomalies is very important. 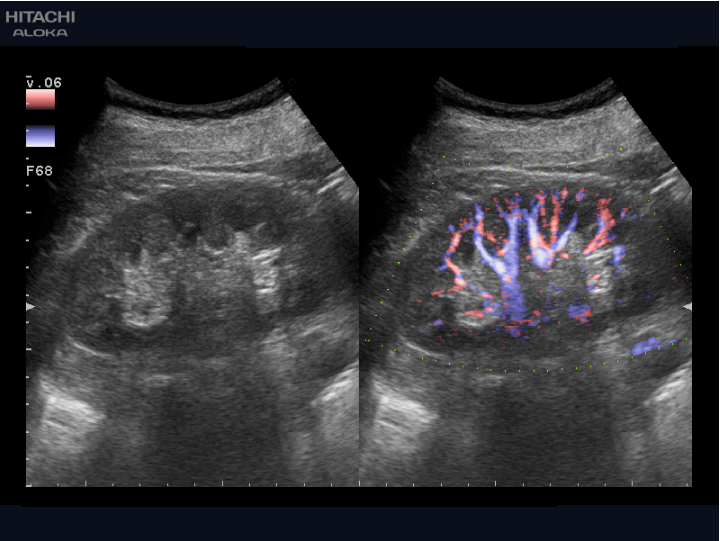 ARIETTA Prologue adapts High end technologies like SIP(Silky Image Processing), which reduces artifacts and noise and clarifies tissue borders, enabling easier observation of the fetal organs, and Dynamic Slow Motion Display(DSD), which offers detailed observation of fast moving structures such as the Fetal Heart demonstrated with the real-time image alongside a slow motion counterpart, enabling better diagnosis. Frequently used measurements can be assigned to the keyboard. Each measurement item can then be activated with a single action, simply by pressing the assigned key. An Echocardiogram helps shows the size, structure, and movement of various parts of your heart, helping in detection of cardiomyopathy, endocarditis, heart failure etc. Greater uniformity and stronger penetration is the main priority of cardiac imaging. Single crystal transducer provides extraordinary high-resolution digital imaging and greater Penetration for adult cardiac applications. Speckle reduction and edge enhancement technologies provide clearly defined images. Broadband harmonics offers significantly enhanced sensitivity and axial resolution. 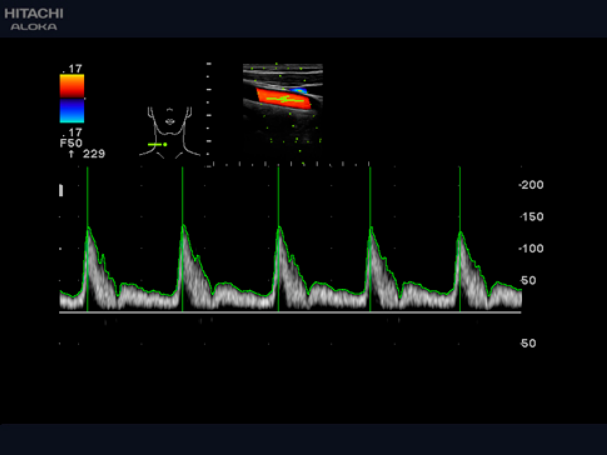 Dual Gate Doppler allows detection of two Doppler waves at different points in the same heart beat. LV eFLOW is a unique non-invasive, high-definition blood flow imaging mode which drastically improves spatial and temporal resolution to improve visualization of the endocardial border in the left ventricle with higher sensitivity and resolution than with conventional methods. LV eFlow may change a technically difficult study into a diagnostic study without using contrast. ARIETTA Prologue’s compact design offers excellent portability*. With its in-built battery, it allows fast and accurate examinations. ARIETTA Prologue’s monitor is detachable and incorporates a full touch panel that offers simple & intuitive user experience with no complicated setting up. The detachable touch screen monitor is wirelessly connected to the base unit and is ideal for challenging POC applications. ARIETTA Prologue’s use cases can be extended by combining it with the cart or the probe tray. *Trivitron is committed to abide by the requirements as per Indian Law for Portable Ultrasound as mentioned in PC-PNDT act. An optimal preset can be selected easily by using the icons for the appropriate body part, body size and organ for study. 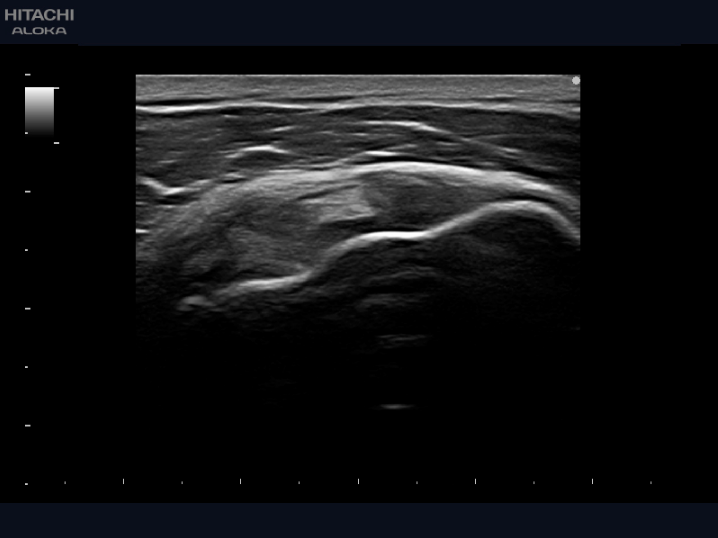 Or, with the selection of a previously acquired image, the system will adjust to the same exam settings which are invaluable for follow-up studies. Basic operations such as image size or gain adjustment can be made with one hand using touch screen gestures which saves lot of time. Automatic image optimization is available. Full screen mode can be used to enlarge the image display, enabling detailed observation. 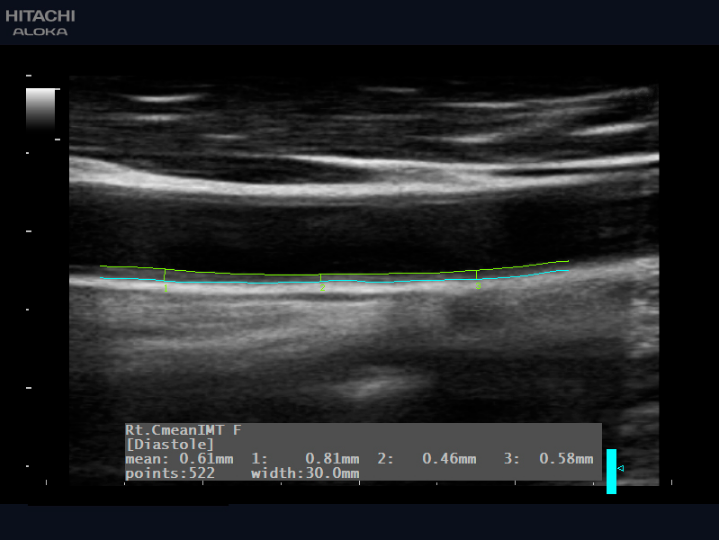 ScanSync* enables freeze and record operations by monitoring transducer movements by analyzing the B-mode imaging. Even in the scenario where both operators’ hands are fully occupied, support from a medical assistant is no longer necessary, and examinations can be performed safely and comfortably.